Melancholia, catarrh, the weakies, dropsy, hectic fever, hydrocephalus, ague, the King's evil, quinsy, croup, iron-poor blood, neuritis, neuralgia, that sinking sensation, teething, diaper rash, and the most dreaded of all maladies, mogo-on-the-gogo-go, in concert with an overdose of reality, fantasies of the exotic Orient and infernal pleasures, and a bad case of the blahs have driven me to the pipe this morning. The pipe, alas, is imaginary. I'm hopelessly addicted to fantasies of smoking opium. The first time I imagined that I was smoking opium it was a moral choice. Now, caught in Lady Opia's soothing yet remorselessly diabolical embrace, it's a medical problem. Fortunately, I'm never at a loss to satisfy my craving; there's no skulking around dark places to get a fix, socializing with the unsavory, nor criminal activity to support the habit. I simply lie down, close my eyes, and I'm in a plush den, a comely young woman attending to my pipe, keeping it full when I'm unwilling to break the spell, fire a neuron and move a flaccid muscle. 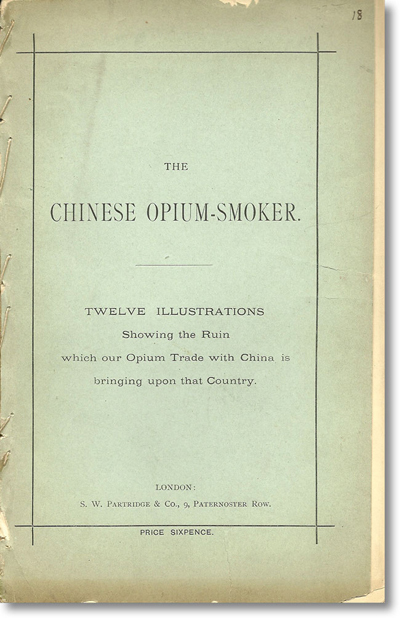 This morning, I'm getting off on The Chinese Opium-Smoker, a scarce reformist tract illustrating the horrors of opium addiction. 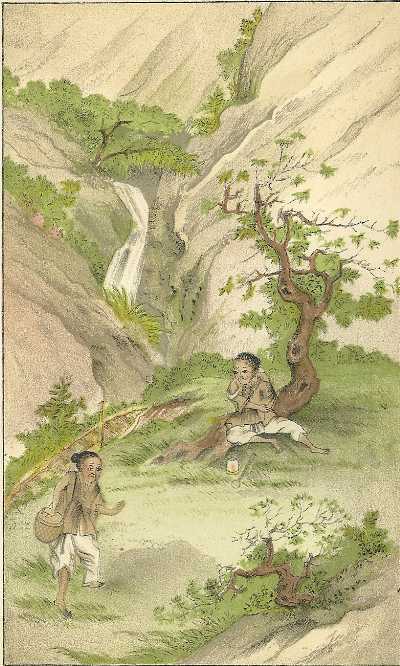 The lithographs are apparently reproductions of original Chinese wood engravings. Cheery-O: It's the perfect accompaniment to Cheerios; breakfast is our most important meal of the day, and high time for endorphins to make a brain-pleasin' splash. 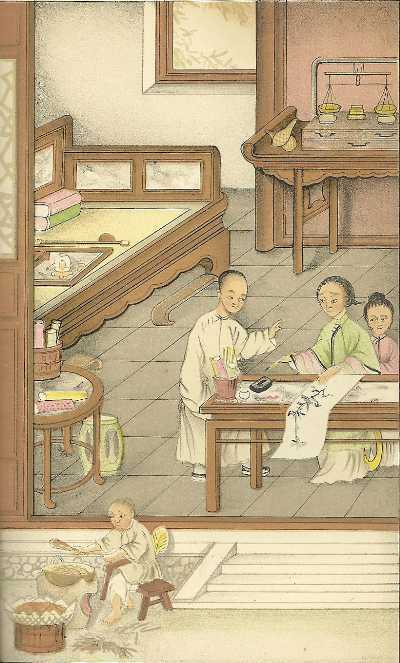 "The title sufficiently explains the nature of this little publication, which shows by characteristic language and equally characteristic illustrations what the Chinese think about opium are exceedingly effective, not to say touching. We trust the plea of a heathen nation with a Christian one on behalf of first principles of morality will not go long unheeded" (London Quarterly Review, Volume 60, April-July 1883, p. 280). In its first edition, the book is divided into four sections: I. The Chinese Opium-Smoker. Twelve illustrations. II. Opium-Smoking in China Compared with the Drinking Habits of England. III. The Extent of the Evil. IV. England's Responsibility in Regard to the Opium-Smoker. This post is being written while I'm in a faux opium reverie; it's writing and publishing itself, and I'm basking in the fabulous reviews flooding in from all media. It's the #1 download at Amazon and iTunes. The YouTube video adaptation goes viral, I'm in contention for a Pulitzer Prize, a committee in Stockholm bruits Nobel, I'm Time magazine's Man of the Year, groupies loiter on my doorstep, panting, and Gore Vidal declares, "God, where has this writer been? His words are crystalline blue notes on a suave stave, by turns rapturous nocturne and Dionysian rondo. I feel like dancing cheek-to-cheek with William F. Buckley Jr!" Adulation becomes me, as I become adulation. We're very happy together. Please don't spoil my imaginary high and bring me down. O-Lan, lose Wang Lung, Pearl S. Buck's the damned Good Earth, and prepare a pipe for me and my guests, a plague of locusts descending to devour West Los Angeles. We must welcome them, provide succor, a nice supper, a cigar, and serenity. It's the least that The Chinese Opium-Smoker can do for those who have journeyed so very far. Yes, I feel their buzz. [Chung Ling Soo and Wilfred Partington]. 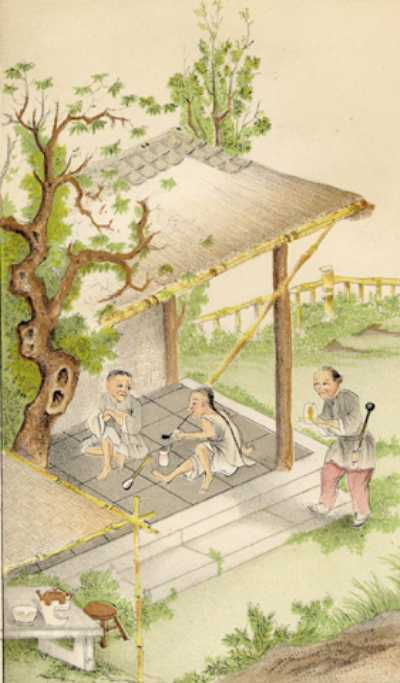 The Chinese Opium-Smoker. 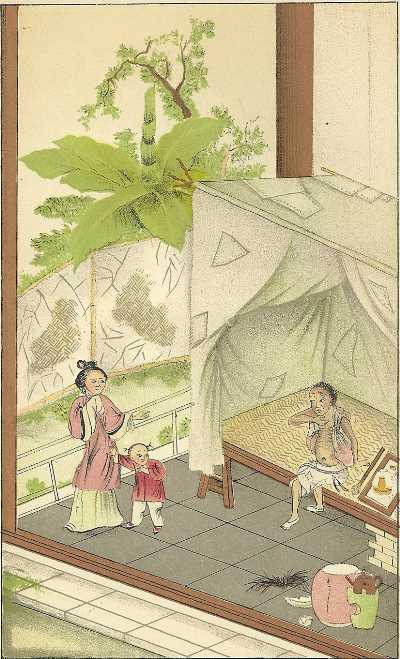 Twelve Illustrations Showing the Ruin which our Opium Trade with China is bringing upon that Country. 12 full-page lithographs printed in colours, showing the gradual downfall of a smoker. Descriptive text opposite each plate. London: S.W. Partridge & Co. , n.d. . Third edition. Octavo. Printed wrappers. leaves including 12 leaves of colored lithographed plates, each with descriptive text to facing leaf. All images courtesy of Lorne Bair Rare Books, currently offering this title, with our thanks.